Awe-inspiring, majestic and breathtaking are just a few of the adjectives used to describe the massive mountains of ice known as glaciers and frankly, none of these do it justice. Synonymous with the “Last Frontier” known as Alaska, the state boasts some 100,000 glaciers covering 30,000 square miles, creating an inimitable backdrop like none other (and best seen from the deck of a Regent Seven Seas Cruises). Since it would be impossible to catch a glimpse of these magnificent works of nature, the following can be seen on Seven Seas Mariner voyages from Vancouver to Seward. Rated the state’s top tourist attraction, be sure to catch the glaciers soon as they are sadly melting due to climate change. 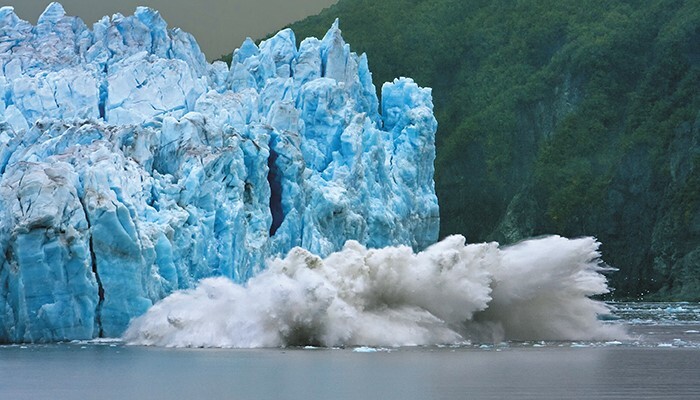 Named after Gardiner Hubbard, the co-founder of the National Geographic Society and Bell Telephone, the Hubbard Glacier is one of Alaska’s biggest. Perhaps the numbers say it all – 76 miles long, 6 miles wide and 350 feet above with the water (and be sure to use the panoramic feature on your camera). Located at Alaska’s Disenchantment Bay (oddly named as a visit to this blue iced beauty is anything but) near the outer coast of Yakutat and against a backdrop of Mt. Saint Elias, expect to see and hear lots of “calving” (the term used when pieces of the ice break off and fall into the sea). 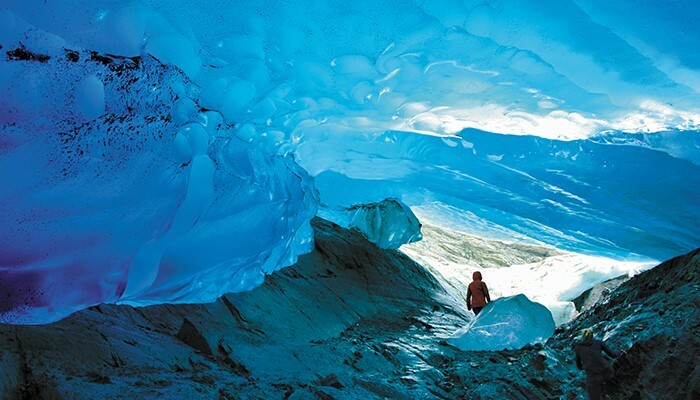 Just 13 miles from Juneau lies one of Alaska’s most accessible glaciers known as Mendenhall. While not as large as the Hubbard (half-mile wide and 1,800 feet deep), the destination to the glacier is much more interesting. Paddle among the icebergs and drifts on Mendenhall Lake via a kayak or hike the trail to Nugget Falls for an up close and personal view of a 377-foot waterfall framed by the snow-capped mountains that translates into the perfect backdrop. 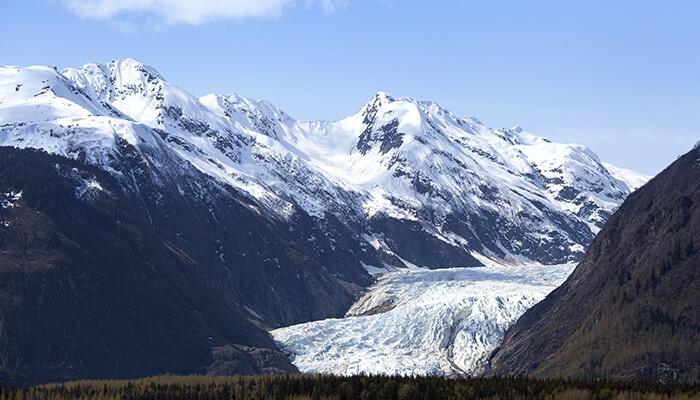 And for those less adventurous, see the glacier from the Mendenhall Glacier Visitor Center where panoramic views will still give you that perfect selfie. The Regent Seven Seas Cruises expedition Venture to Glacier Point will offer a different vantage point via an enclosed custom-built boat. The 75-minute cruise through Alaska’s deepest fjord introduces you to marine wildlife and the beauty of the tranquil mountain lake with a 31-foot catamaran voyage to the incredible Davidson Glacier. Meander through the fjords and come face to face with the icy glacier wall while sea lions, whales and seals await their photo opportunity. The tour also includes a hike through the dense rainforest. While exploration is at the core of every trip, why not reward yourself with a $500 Shipboard Credit per suite when you book select Alaska, Mediterranean, Northern Europe or Panama Canal voyages by February 15th with Regent Seven Sea Cruises’s Time to Explore. From a day of exhilarating dog sledding on Mendenhall Glacier to successfully mastering the art of paella with a Chef’s Market tour and lunch in Valencia, your shipboard credit can be used pre-cruise to book an incredible selection of Regent Choice Shore Excursions. It’s just another way to make your travels that much more memorable.